Get into the spirit of Halloween with these quick and easy Halloween sushi balls. Requiring just basic ingredients and a little creativity, they’re a delightfully novel way to impress your guests however you’re celebrating! Before making the Halloween sushi balls, you will need to spend a few minutes preparing the various shapes to be used as facial features for the pumpkins. Nori sheets are ideal as they will adhere well to a moist surface, such as salmon or cooked white sushi rice. Use a pair of nail scissors to cut out small triangles from the nori sheet. For the mouth, you can either use tiny straight strips, or zig zag shapes. You may need to hold smaller pieces with the tweezers as you cut. Tip: Cut out the shapes over a dry white plate. This will make it easier to identify them quickly when it comes to decorating the sushi balls, and prevent them from coming into contact with moisture from the sushi rice/ salmon. Place a large, square piece of cling film onto your chopping board. With moistened fingers, transfer a small amount of sushi rice over to the cling film. 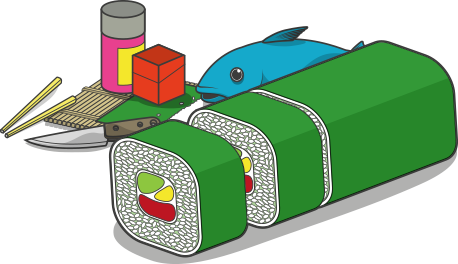 Bring the four corners of the cling film together above the sushi rice. Use your fingers to gently squeeze out any air from the top of the rice upward. Begin twisting the cling film from the base upwards, forcing the rice into a solid ball shape. Undo the cling film, then transfer the rice ball over to the chopping board. Lay a thin slice of salmon flat on your chopping board. Using a sharp knife, cut out a circle of salmon roughly the same diameter as the rice ball. Lift up the circle using the tip of your knife and position atop the rice ball. Gently flatten the piece using the tips of your fingers. Using the tip of your knife, cut out a small circular shape from the nori sheet roughly the same diameter as the ball of rice. Position the circle atop the ball, then gently flatten into place using the tips of your fingers. Wrap the covered rice ball in cling film once more. Twist from the top of the sushi ball upward, squeezing out any trapped air. Once the ball is fully compacted into shape, unravel the cling film and return the ball to your chopping board to decorate. Using a pair of clean, dry tweezers, begin adding the facial characteristics to your pumpkin by positioning the triangles accordingly: two larger ones for the eyes, two smaller pieces for the nose, and the zig zag shape for the mouth. To create the stalk of the pumpkin, simply position one or two pieces of wasabi a few millimeters above the eyes using tweezers. Fill one corner of a sandwich bag with Kewpie mayonnaise. Using a pair of scissors, make a very small hole at the corner. Gently squeeze the bag as you apply the mayo to the surface of the sushi ball. Start by creating a large star/ snowflake design, then piping on a graduating spiral to finish the web.